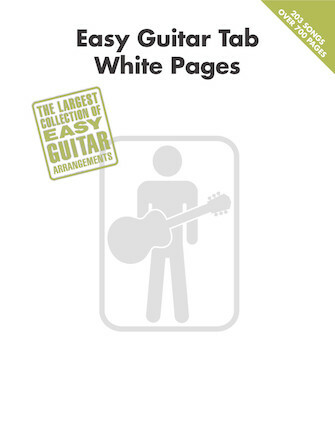 Our first-ever easy guitar White Pages collection! This awesome songbook packs in over 200 easy arrangements in notes and tab of some of the best guitar songs ever, from all styles of music. Songs include: Ain't Too Proud to Beg • Are You Gonna Be My Girl • Bad Case of Loving You • Bésame Mucho • Big Me • Crazy • Crying • Do Wah Diddy Diddy • Don't Stop • Footloose • Guitars, Cadillacs • Help Me Rhonda • I'll Be There • Ironic • Let's Stay Together • Longer • Low Rider • Me and Bobby McGee • My Maria • My Own Worst Enemy • Name • On Broadway • Pinball Wizard • Summer in the City • Three Little Birds • Time Is on My Side • What I Got • Woman • You're My Best Friend • Zombie • and hundreds more. Over 700 pages!